And this boat is created in the same way! This boat is my answer to the proposed NAMBA Offshore class. I really like this class because it required each boat it look realistic to that of a real offshore boat. Which just proves what people like. My Boat has been voted #1 as peoples choice at a local model boat regatta. Against very well constructed mahogany boats and scale ships. Made of cast aluminum, all shafts run on double ball bearings. The kit comes with the hull and deck pre joined and is made from GRP (fiberglass reinforced plastic). Along with the hull, other details are also included, display stand, retaining rail, servo console, pushrod connector, sealing tube, bellows, steering pushrod, retaining clip, etc. 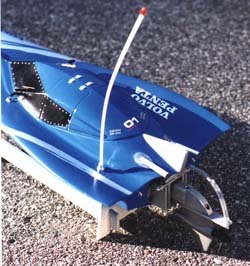 Also included are the fine details like side mirrors, windshield wipers, cockpit vents, bow rail, etc. The instructions provided are very clear, show construction of the two options of assembly, and what types to glue to use on the different materials. The method I picked is my own. 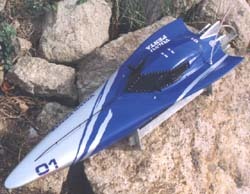 Graupner said that it would be to much for the hull. But I have now got the boat running where I think it works the best, and it does work! What you will also need is your drive system, the instructions show either the Z-Drive 600, or twin surface drives (counter rotating). I wanted to run 12cell, so the Z-Drive 800 is what was required for the realistic appearance. Also a good ESC to handle what ever motor you choose to use, and radio & batteries. As seen in the left picture, I also custom made exhaust pipes & water cooling tube to fit. tight turns the canopy would slide around and splash water inside. Finishing the two versions is quite simple, and the decals provided go on easily. Of course you can do what ever you choose for your own liking. My self I decided after some thinking, to replicate the first real B24 made. I used silver, & true blue Krylon paint. Along with a couple coats of a clear. Finishing the two versions is quite simple, and the decals provided go on easily. Of course you can do whatever you choose for your own liking. Myself I decided after some thinking, to replicate the first real B24 made. I used silver and true blue Krylon paint. Along with a couple coats of clear. Well for this section all I can comment on is my own results of the setup I did. The first time I can the boat, I found it was really jumpy. After trying a couple of different props, and adjusting the drive angle I figured perhaps Graupner was right about it being to much for the hull. But I decided to add trim tabs after I saw that my dad's first mono hull reacted the same way. So the first run after adding them, the top speed increased, and the boat ran perfect. In conclusion, I think this is a very well designed boat. The quality of the kit is excellent, and I highly recommend this boat for all levels of modelers. Watch out offshore racers, the B24's are coming!